A twinned rainbow, pictured in foreground, happens rarely, when the primary bow splits in two. YouTube has taught us that a double rainbow may be worthy of an ecstatic rant. But there's a natural multicolored phenomenon even more spectacular: a twinned rainbow. A twinned rainbow happens when the primary bow splits in two. Scientists have found out more about how this rare event happens by using sophisticated computer science techniques. Iman Sadeghi, a software engineer in Google's graphics division, did research on the physics of rainbows while pursuing his doctorate at the University of California, San Diego. He and his adviser, Henrik Wann Jensen, who worked on the James Cameron film “Avatar," collaborated with scientists from Spain, England and Switzerland. The team plans to publish the results in the journal ACM Transactions on Graphics. Sadeghi and colleagues set out to reproduce different rainbows. They created computer simulations to recreate the geometry of a real raindrop and capture the behavior of light as it leaves water drops. In a primary rainbow, light gets reflected from water droplets and then comes out. In a secondary rainbow, light gets reflected twice in the droplet before emerging. But what about twinned rainbows? By looking at simulations, Sadeghi and colleagues realized that spherical water drops cannot possibly produce that effect. Instead, you'd need a rain shower with both small spherical water drops and larger, flatter droplets that they call "burgeroids" because they look like hamburgers. The burgeroids shift light in one direction, while the small droplets produce a separate bow. It takes a uniform distribution of large drops of water of the same size to produce a twinned rainbow, Sadeghi said. Since that's usually not the case, twin rainbows are rare. This research is "the first scientific, accurate simulation of twinned rainbow in history," Sadeghi said. "We ended up pushing the edge of rainbow science." These findings might be useful for a film or video game maker concerned with scientific accuracy in the portrayal of rainbows, although typically those media don't pay attention to such details, Sadeghi said. Sadeghi's method is a lot slower than just copying an existing photo of a rainbow - each water drop you want to simulate takes six hours, he said. "The application is very narrow for specific people who care about the appearance of rainbows," he said. "But if a movie wants a twin rainbow, they should definitely come to us." "I learn at once!" Zhang Jin ought to sentence position Yun claimed: "Oh, the evening I'm going for you, you need to start off coaching." Rainbows and puppies tick me off. at least all animals go to heaven. How I love this page..it is heartening to read comments on people with religious belief and that of science belief.God created MAN, endowned man with wisdom,understanding,knowledge,freewill to explore the universe. Keep it coming please..
God don't got no mother you son of a donkey. To the Christian poster below me: get prepared to be ridiculed. Double double rainbows all across the sky, yeah yeah oh my God... what does it mean.! How do they explain triple rainbows? Ya'll get off Amy's chukus. I can't see the pretty picture either... Because the MOBILE version of this site usually usually DOES NOT have the pictures that the desktop version has. Sheesh. Give the girl a break. From watching slow motion videos of rain falling in the Amazon on the Discovery Channel, you can clearly see that rain droplets shift, in fact I do not know why this article implies that scientists thought all rain looked the same. I really doubt the authenticity of half the things stated within this article. doesn't it have something to do with the size of the tetrahedron (water molecule) and light bouncing off of a certain sized tetrahedron? so a fine mist would do it. so to get doubles we have to figure out how to get the garden hose to have a mist with burgeroids. ok. thanks. By the way, Ive seen 2 double rainbows, here in Mississippi, within the last 6-8 months so I think theyre becoming more common these days. Probably because of more pollution in the air. Or because they are very common despite what these researchers say,I see them all the time in Oregon one of the least polluted states. Saw a couple in a few months in NC about two years ago, none since, but have not seen many rainbows since then either. Does not seem to be an exceptionally rare occurance. TWINNED RAINBOWS! That is what the article is about! Totally amazing at the people on these message boards that don't comprehend what they have just supposedly read! Bible thumper, do you have nothing better to do than cut and paste stories of the baddest mass murderer/terrorist of all times? Sorry but I dont see how someone who destroyed entire towns and eventually murdered the entire world, except for a few on a boat, has relevance to this story? Really!!! We are spending money on reseaching this instead of a cure for Cancer, Aids, or ect..really don't know what to say!! Smh. Researching how light refracts in a water droplet's cavity is definitely MUCH cheaper, and simpler, than any AIDs or cancer research. It is really pretty basic science. Did you know that this particular science concept has led to production of something called "quantum dots", which is currently being developed into a new type of highly efficient lighting? This development will help reduce pollution from power generation, which should improve our health as a result. I approve of basic research like this. It leads to other improvements of our condition, whether you know this or not. By the way, I also have a framed photograph of 2 double rainbows (thats 4 of them) which I took on a trip in Colorado at the tail end of a magnificent dark storm just after it crossed the Rockies. The clouds were near black, the sun had just began shining again from the west above the mountains, and the wind had kicked up a bright tan dust storm that the rainbows dipped into. Stunning! Post the picture of your rainbow on you tube would love to see it...also ahve seen 1/2 dozen double rainbows in MO but not that vivid. science is good! but the universe is better. Amen for rainbows.. GOD is good.. Yes, Ra is a good and glorious god, but then again, so is Zeus, and Thor... not a fan of Baal, but Vishnu is probably my favourite. Mmmmmm I love my Gods and Goddesses: Primaries: Isis, Bast, Athena, Venus, Mercury, Mars, Saturn, Ganesha. Though I do love Asklepios, Thoth and Jesus added in the mix for healings and Hestia, Vesta, Brigid, and Bride for housecleaning. What do you think of a new God Technos or Technia for all things tech? 🙂 May the Gods Smile upon us ALL! Living Myths. Awesome!!!!!!!!! i have a picture of a primary and secondary rainbow or twin rainbow on my phone. I took it back in august i think. Wish i could put it on here. Rainbows are beautiful because they are a sign from God. No its not. God has nothing to do with rainbows. Its water particles reflecting the prism of light. Simple. Did u go to school? um a rainbow is a sign to us from God that is a reminder of his promise not to flood the earth like he did in Noah's Arc. Have you read your Bible? reguardless of how they are made it is still God's creation and is a sign! People still die in floods today every year *cough Tsunami*, and they see rainbows afterwards while holding their dead babies.. miracle? or is God just having good laugh. "We ended up pushing the edge of rainbow science." Dude...I totally did that at a Dead show back in '87. WHOA, that's a full rainbow. How about a rainbow at night ? Saw one this evening with a very bright moon and St Thomas VI in the background. Or would you call this a moon bow ??? You should see how they taste! Well this must be big news in Rainbow bright world :)) I seen one double and one tripple myself. Seen the double on Lake Mendocino and another tripple in the foothills one bow to every hill too. Wish had camera. Twice I've witness perfect triple rainbows. Once in Crested Butte, Colorado and once on Maui. Both places are magical and to witness this was awesome against the scenery. We had massive flooding in September here in the Northeast. The day most people who had evacuated were allowed to go home, there was an amazing double rainbow in the sky. I had never seen one before that day. Every rainbow has a twin, but the second is so faint it is usually overlooked unless the first is very strong. "illmater" – if you carefully read the article, you'd know that not every rainbow has a "twin". There are DOUBLE rainbows, but TWINNING rainbows are rare – READ THE ARTICLE to understand the difference...jeez. And GOD said to me......, just the other day at brunch, "...and the rainbow must appear in the cloud...They are kinda pretty! Don't you think?" – That booming voice always scares the waitress. This can happen in nature. I have photos to prove it. It is caused by a reflection of the sun on water. At sunrise with very flat water behind you, you will see exactly what was shown in the above photo. Two regular rainbows and a third with its origin in the base of one of the regular rainbows. If things were very bright, there would be a fourth rainbow. That process creates additional rainbows but they would be situated in a different part of the sky. I saw a quadruple several years ago. There was a small rain shower right in front of the setting sun. The whole sky went golden and for about 10 minutes, there was a quadruple rainbow, two pairs of doubles. 3 of the 4 were full semi-circular rainbows. I took a picture of one of these twinned bows within the last two months. I had never seen one before. I'm really glad someone figured out how they're made. Now Im hungry for rainbows!! littomika on August 30, 2011 I like that I am a getraful person. I love being able to show my appreciation to others and count all of my blessings. I dont like taking things for granted, because life is so special and the people you love should feel they are loved. It means that nature produces beautiful things. Why does it have to MEAN anything else? Apparently you've never seen the video. It MEANS that physics can explain everything, eventually. There was no bow before Noah because it had never rained before then. Nothing to do with physics. Hi, the picture is at the top of the post. Thanks for reading! 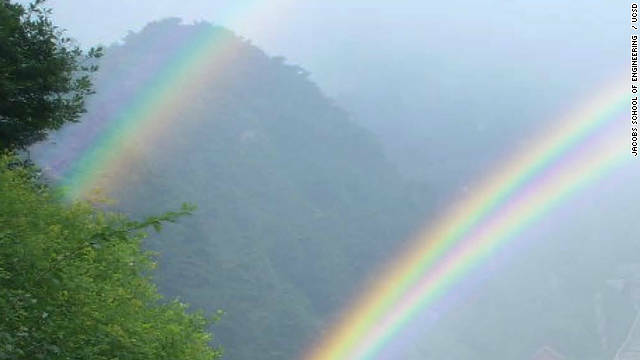 The whole picture shows a double rainbow, the one that is considered a twinning rainbow (split rainbow) is the one in the bottom right hand corner. If you look at it you can see about 1/3 of the way up it split and becomes two rainbows., the colors repeat. Relax, Seriously. There have always been, and will always be, people dumber than hammers. Who else would we elect? Very interesting! Just understanding it is cool, but i wonder how we will apply more advanced knowledge of light refraction. Thank you for copy and pasting a bible story that i learned when i was three, in KJV to boot. How about some real discussion? It is time to replicate these tin rainbows artificilly. Put them in city centers or touristic places! in an economy with surplus deficit, things like this might happen again. 10 and with every living soul that is with YOU, among fowls, among beasts and among all living creatures of the earth with YOU, from all those going out of the ark to every living creature of the earth. 12 And God added: “This is the sign of the covenant that I am giving between me and YOU and every living soul that is with YOU, for the generations to time indefinite. 13 My rainbow I do give in the cloud, and it must serve as a sign of the covenant between me and the earth. 14 And it shall occur that when I bring a cloud over the earth, then the rainbow will certainly appear in the cloud. 15 And I shall certainly remember my covenant which is between me and YOU and every living soul among all flesh; and no more will the waters become a deluge to bring all flesh to ruin. So there were no rainbows before the flood and God changed the laws of physics for Noah? LOL! The Bible never mentions twinned or double rainbows, so like evolution and dinosaurs they are either 1) fake, or 2) the work of Satan. You are indeed a perfect logician. Fool. Obviously rainbows are evolving. Funny, had it been a bird flying over that left some dropping on Noah's head, we'd now have the "sign" that bird crap is some holy sign from god. Oh well, one day man will grown up and stop believing in fairy tales. It works so much better when you have colorful characters outlined in black with dialogue balloons for the text. The is no such thing as santa, easter bunny, ghosts/souls, and magical sky fairies. Welcome to the 21st century.